Contrary to popular belief, landing pages are not websites. In fact, they constitute only a single page. However, they are incredibly important in your online marketing campaigns you can never go without them. Landing pages can increase conversion rates to as much as 300% and potentially save a hundred thousand dollars on effective PPC implementation. Like the ads, though, landing pages have to be tested. After all, maintaining them can be very costly, especially if we’re talking about numerous, different landing pages for granular campaigns. Finally, Age Prevention Has Become 100% Real! Move the photos around. Do you know that photos can convey a strong message and a lot of emotions? Humans are very visual, and as a matter of fact, we’re designed to perceive images a lot quicker than words. A good landing page uses photos to support the message and break the text. The trick is in choosing the image that speaks to your audience best. If you are selling an anti-aging product marketed towards women, you could choose between a photo of an aging person, or of a young woman who is looking worriedly in the mirror, or of a woman who is exuding a lot of confidence and happiness. Split testing can then be used to determine which among them delivers the right message or has the strongest positive impact to your target audience. You can also test their placement. Usually, photos that are in the top middle of the page are effective since they’re quick to spot, but it’s also possible that an image on the left side of the page can draw attention much better. Make sure your photos are original. If you are using stock photos, make sure they are legit. Images should be clear, sharp, and precise in terms of contrast, brightness, and color. Use photos with the smallest possible file size so they will load quickly. 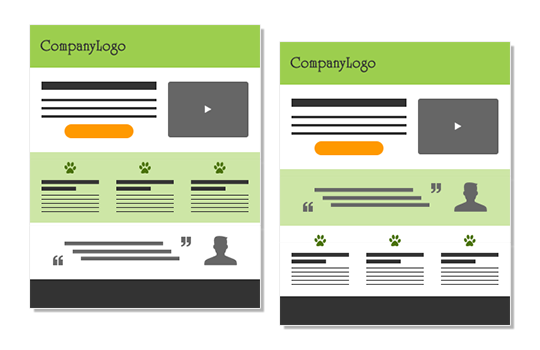 Landing page testing can be complex, so you need a professional to help you. Contact us to find out how we can help. Call us at +61 8 8372 7834.